Courts are sources of law in that they offer written explanations of the decisions they make about the parties before them. These written decisions or “opinions” are primary authorities in that they affect those litigants, but they serve to interpret and construe the jurisdiction’s laws for future litigants. The federal court system is structured according to the United States Constitution and statutes, consisting of federal trial courts and appellate courts. The trial courts are called “district courts”—each covering a state or part of a state—and above them are circuit courts of appeal, each usually covering a group of states. 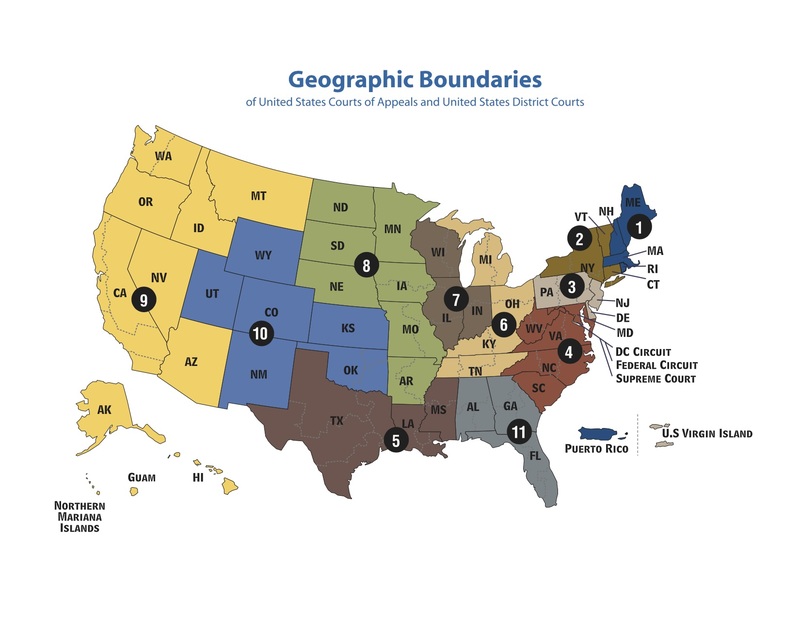 See the figure for a breakdown of circuit-court jurisdictions. Appeals from circuit courts are to the U.S. Supreme Court, which is the highest court or “court of last resort” in the United States. There are several other courts and court-like entities in the federal government. We’ll discuss them if and as they come up. Texas has two courts of last resort, a “Supreme Court” for civil and juvenile matters and a “Court of Criminal Appeals” for criminal matters. Under them are 14 courts of appeals, which hear both civil and criminal appeals, and beneath them are thousands of district courts, county-level courts, justice courts, and municipal courts. See the figure below for more details. If you would like to learn more about the Texas judicial system, see the Texas Judicial Branch’s online brochure The Texas Judicial System.